This is the story of how Oregon fan Waylon Coy got the experience of a lifetime with Heisman trophy winner Marcus Mariota. Mariota had an unforgettable last season with the Ducks, which led him to win myriad awards, including the Johnny Unitas Golden Arm award. Marcus was to receive the Golden Arm on Friday in Baltimore, about an hour’s drive from where I live. The media was more focused on the Heisman award which meant less attention on the upcoming Golden Arm ceremony. 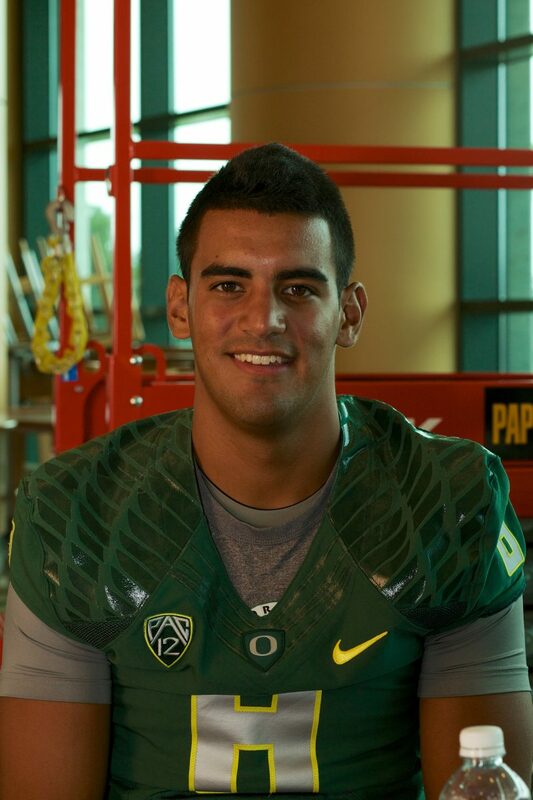 Mariota flashing his trademark smile. With a little research I was able to find out that the ceremony would be held at the Embassy Suites Baltimore Inner Harbor & Grand Historic Venue. The only information that was missing was the time of the event. With this knowledge I was left with a decision; to go or not to go. I requested the ceremony day off (Friday, Dec. 12, 2014) with the idea that I would go to the hotel and wait all day if necessary to complete my mission. After spending a good portion of the day scouring the internet for information on the time of the event, I decided to just go directly to the source. The contact information for the event was set up to speak with John Unitas Jr., I crafted a brief but polite email to Mr. Unitas from my work account, thinking it would give me some weight. I was shot down. Mr. Unitas clearly didn’t desire to have any uninvited guests at his ceremony. Undeterred, I called the hotel directly and was told that the ceremony would be held from 6:30 to 9 p.m. In rush-hour traffic it should take about 90 minutes to drive to Baltimore. I planned to leave at 4 p.m. in order to scope out the hotel and figure out my next move. The original plan was to wear my bright yellow Oregon hoodie to stand out among the crowd and hopefully flag down Marcus when he arrived at the hotel and get his signature. Plan B was to wait in the lobby for his arrival or departure. Either way, I was getting that signature. On Friday my wife and I left home at 4:30 p.m., which was later than we intended and led to some heavy traffic. By 6:30 we had made it to the hotel only to see that there were no fans outside. We stepped into the hotel. It had no lobby, just a waiting area which was filled with folks who attended the Army/Navy game that day. There were no signs about the award ceremony so I decided to snoop around the hotel rather than tip off the employees to my plan. After learning we’d arrived an hour late, we hopped in the elevator and headed up to the second floor. I kept the helmet in a messenger bag over my shoulder and my yellow hoodie hidden underneath a light ski jacket. I poked my head down the hallway and looked both directions. In the distance there was a white sign at the end of the hallway. As I walked toward the sign I saw it in huge letters on the wall: “Corinthian Room,” and an arrow pointing down a hallway. I followed my gut and headed down the hallway. 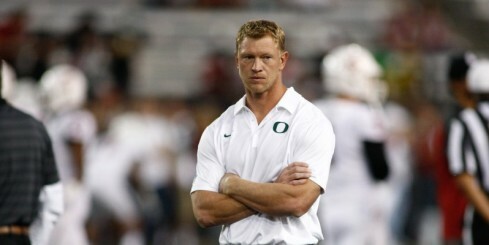 Frost was one of many members of the Oregon staff trying to support Marcus that night. It was a nice room with vaulted ceilings, crown moldings, chandeliers, and elegant furniture. As I walked into the room I noticed Scott Frost and the other guys walking out of the other side room. Upon further exploration I noticed a photo shoot station and a photographer sitting down. I knew I was definitely in the right place. I strolled to the door that Frost went through to check out the scene. Through the door was another little room and another door to a hallway, where about six different guys were lined up to go into yet another room: the ceremony room. I slowly turned and walked back into the photo shoot room. 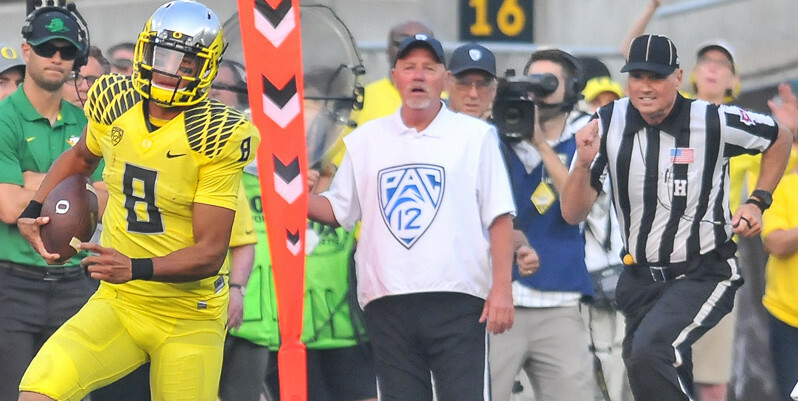 Frost walked out a few minutes later along with Andy McNamara and various other people, and trailing them all was Mariota. I felt way out of place. How was I going to pull this off? I acted casual, but I was keeping an eye on the action and snapping a couple pictures of Marcus from afar. Then came the waiting game. People came in waves to get pictures with Mariota. This went on for about 10 minutes. 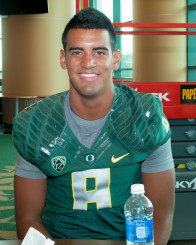 Then, due to a break, Mariota stood quietly making some small talk with the photographer. As Marcus introduced himself to the photographer I saw my golden opportunity. I stood and walked casually across the room toward the exit like I was going to leave. I stopped right next to the door, set my bag down and very quickly pulled the helmet out. I made a U-turn, walked right by McNamara and directly up to Marcus. With a huge smile, the helmet in my right hand and a sharpie in my left, I mustered a few words, “Hi Marcus, would you sign my helmet?” He was perplexed. With scrunched eyebrows and a sideways glance, he consented. While he was signing the helmet, the photographer was snapping away. Marcus handed back the pen and let go of the helmet. 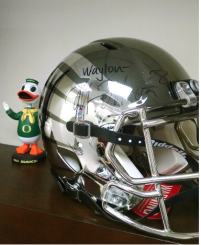 Sure enough, I got the signature: Waylon – Marcus Mariota 8, right across the top part of the silver wings. My heart was pounding through my chest as I walked down the hall and out the room. A mix of excitement and nervousness flowed through my body. McNamara looked directly at me, and I could tell he was confused about what I was doing there. “Yeah man, awesome,” I replied. I headed back to greet my wife with a huge smile and a signed helmet.